If you are thinking about getting an outdoor kitchen, then there are some magnificent options that will turn your backyard into the envy of the neighborhood. Our expert designers are passionate about creating custom kitchens that will blend into your outdoor space in perfect harmony. 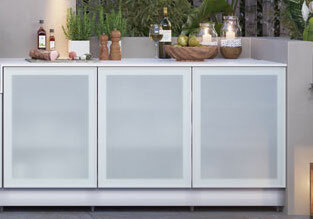 We love alfresco dining and we want to create a kitchen that will make you fall in love with it too. Prepare to be blown away by the custom kitchen that we can create for you and your individual needs. Of course, an outdoor kitchen doesn’t need to be complex and complicated to be amazing. In fact, we’ve found that the more add ons and intricate design features you incorporate, the more intimidating your outdoor kitchen starts to look! That’s why our designs boast two factors; they are simple and they are brilliant. We want you to have an outdoor kitchen that is inviting, appealing and a fun space to spend time in. That is why when you ask us to create your special place, you are guaranteed a design that is as passionate about outdoor living as we are. Of course, we know that while custom-designed outdoor kitchens are an amazing choice, they are not for everyone. We are also delighted to offer ready-made outdoor kitchens which offer great features, appealing designs, and attractive finishes. We know that outdoor spaces vary in size and shape and one size certainly does not fit all. The way you plan to use your outdoor kitchen, as well as the environment also plays a role in which kitchen would best suit you. That is why our expert staff are always at your service to help you choose an outdoor kitchen that is going to be nothing short of sensational. Have you ever had the pleasure of enjoying a pizza from an outdoor pizza oven? If you haven’t experienced this yet, quite simply, you have not lived! Not only is the process fun and entertaining, the result is fantastic. That is why we offer kitchens with built-in pizza ovens as part of the design. That’s right, we are passionate about incredible kitchens, but we are also passionate about incredible food! We also offer outdoor kitchens with built-in BBQs so that all of your dining and entertaining needs are fully covered, all summer long! If you are going to put in the investment of getting an outdoor kitchen fitted, we know that you want the money that you spend to go a long way. You certainly do not want to find that the cabinets are starting to rot or look worse for wear within a short period of time. We sure don’t want this to happen to you either! Hence, we offer stainless steel and metal cabinets that are made to an exceptional level of quality. All you need to worry about is what you are going to put in them. 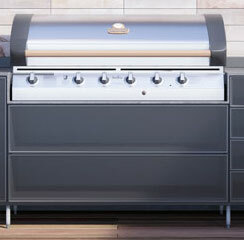 So, you were interested in that little comment that we made earlier about offering a range of built-in BBQs as part of our outdoor kitchen design? Of course, you were! There is nothing quite as special as enjoying an outdoor BBQ with friends and family. In fact, often are best memories of summer stem from those long, sunny afternoons and relaxed evenings enjoying great company, beautiful weather, and delicious food, straight off the BBQ! Don’t worry, we know that you are interested in knowing a little more about our built-in pizza ovens too. Our vision is a simple one; we strive for excellence and a personal service for each and every one of our clients. It’s what we have done for years and it is what we will continue to do for as long as make outdoor kitchens. We know that a pizza oven as part of your outdoor kitchen can change the way you cook and entertain for life. Our expert designers not only create integrated pizza ovens that are going to deliver on amazing pizzas, they also create them to look amazing too. You will see for yourself that having a pizza oven as part of your outdoor space has a rather magical feel to it. Of course, while we want your kitchen to look amazing, we also want it to be practical and functional as well. ‘All picture and no sound’ is not what we deliver on! That is why we offer a great range of outdoor kitchen appliances to suit your own individual needs. 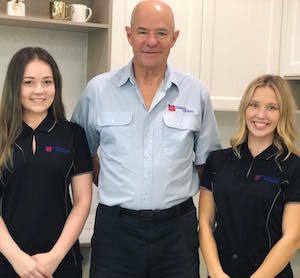 If you are not sure which appliances would best suit you, we are at your service to discuss your kitchen use and recommend appliances that will suit you perfectly. Indeed, having an outdoor kitchen opens up the door to a full world of amazing opportunities. We hope that we can be your outdoor space partners and create a kitchen for you that is nothing short of spectacular, in fact, you will want to spend every minute in it!